454 pp. At the time of this review (9/20/18), the book holds a 4.7-star review on Amazon with 1,952 Reviews. Book Obtained By: Christmas present because I told my family I wanted the full series after reading the first book. “Cinder, the cyborg mechanic, returns in the thrilling installment of the bestselling Lunar Chronicles. She is trying to break out of prison—even though if she succeeds, she’ll be the Commonwealth’s most wanted fugitive. 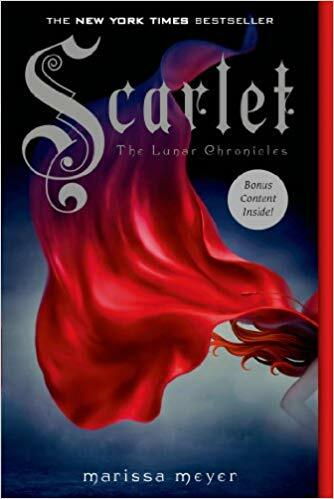 Marissa Meyer continues her Lunar Chronicles that she began with Cinder. This mashup science-fiction/fairytale is best read, I believe, after Cinder. Meyer does a great job immediately establishing the world via Scarlet’s mode of transportation, the text message that launches her into the story, and the evening news covering an event from book 1. However, the book will be so much richer for those who are already along for the ride. This is as much Cinder’s story as Scarlet’s. The number of point of views blossoms, sending us from Scarlet to Wolf to Cinder to Kai and Queen Lavana and others. I know this is a retelling of Little Red Riding Hood, and although I expected the big points Meyer had to hit, she continually surprised me on the journey. Of the four main books in the series, I connected with this one best, I think because of Wolf and Scarlet. Meyer paints Wolf as a complex character. I know he must be a bad guy, because this is Little Red Riding Hood. Add in the connection he and Scarlet share, however, and you have a recipe for constantly shifting ground that makes for a delicious dilemma. I can’t expect how any scene will end. Meyer continues to sprinkle in backstory about this world, increasing its depth and believability. I hungered to know more about Wolf; about the missing grandmother. Slowly, Meyer unveiled the story. She deepened my hate for what Queen Lavana intends for Earth and its people; she deepens my love for what Cinder willingly puts herself through to try to prevent that fate. Each page, I fall a little more in love with Iko and her quirky personality chip; Kai, as the leader who has to make his own big decisions; Wolf, street fighter, and how much more? ; Scarlet, fire-brand who speaks her mind and marches into danger with her hoodie as her armor, along with her (usually) excellent aim with firearms. Because I’ve fallen so far behind in my book reviews, I can’t give the usual depth of review about this book, but this should give you a taste of what to expect. If you like science fiction, this book could be for you. If you like fairytale retellings, this one sings with originality. I haven’t read sci-fi in years, but I do watch sci-fi movies, so I had no problem believing in the world Meyer built. While I still cringed at the filtering words like “saw” and “heard” that pushed me out of a character’s point of view, I forgave them more in this book because I so enjoyed the characters and their journey. Hence, giving this book my top rating. Bonus material in this book includes a Q&A with the author, a short story of Wolf’s youth (“The Queen’s Army”) and a teaser chapter for Cress. Stay tuned for my review of the third book, Cress, in another few days. Learn more about Marissa Meyer at her website. This entry was posted in Uncategorized and tagged amreading, bookblogger, Fairytales, Marissa Meyer, Science Fiction. Bookmark the permalink.